This is fairly time consuming as the onions do have to be cooked till they are gorgeously caramelly and sticky. But once that's done, the rest of the soup is remarkably easy to put together and uses minimal ingredients. I tend to use the healthier olive oil instead of butter, but if you prefer, you can use butter to caramelise the onions. This recipe is from Raymond Blanc, but I have adapted it to suit us. I still use the wine (even with a little one, as the alcohol is boiled away), but you can substitute a medium sherry instead which adds more sweetness to the finished soup. We eat this with French bread and grilled cheese and its a lovely, satisfying lunch!! Put the olive oil and butter into a heavy pot, heat for a few minutes and toss in the onions. Cook, stirring ocasionally for about 30 - 45 minutes, don't rush this part, as the onions do need to be caramel and sticky and sweet. The colour is up to you, I like it fairly light, but if you want a dark colour keep cooking. Take care not to burn the onions. Add the sugar and flour and cook for another 5 minutes. Add the white wine and the stock, and bubble for another 10 minutes or so. Season with the salt and pepper. Grill the cheese on the French bread. 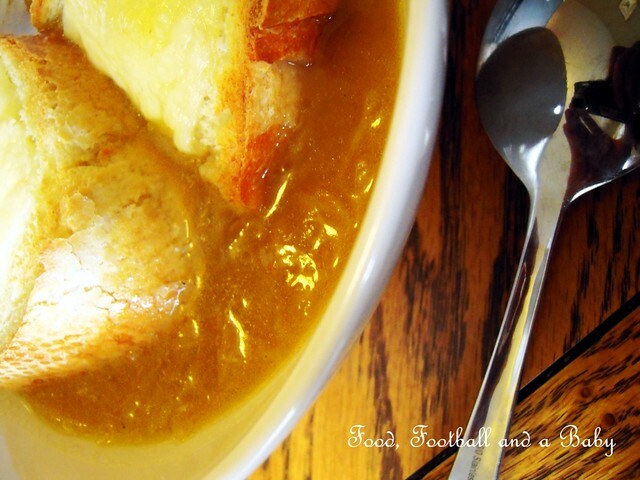 Ladle the soup into bowls and top with the toasted bread and cheese. Thanks Michelle, I actually cooked up a batch of onion and coriander soup based on your recipe with a few alterations; I didn't use butter (you just have to prolong the initial cooking time) and instead of the croutons/cheese I added a stonking huge amount of fresh coriander leaf chopped up and ate it with some lovely salt-crusted bread. Yummy and thank you! Yum yum, you're making me want some now Chumbles :-) Where do you get salt encrusted bread by the way? Perhaps a little exaggerated, but Tesco tiger batons are normally made by using an egg wash and with a lot more salt than usual and for some reason it concentrates in the crust to help create the tiger effect, I think! Tescos also does a salt and cracked black pepper loaf which again is lovely. But beware, the salt police will get you! How embarassed am I... I checked with the real baker (at 6.10 a.m. this morning) and it is apparently a coating of ground sesame seed with a pinch of salt in the egg wash. Gorgeous and reduced to 30P for a baton today!